Isn’t this page from Fitzgerald’s baby book incredible? A friend shared this recently in light of the push to stop teaching handwriting in schools. Wanting to know more about the page, I found an interesting site that was made by/for the author of Scrapbooks, Jessica Helfand, called The Daily Scrapbook–though I fear it isn’t being updated. 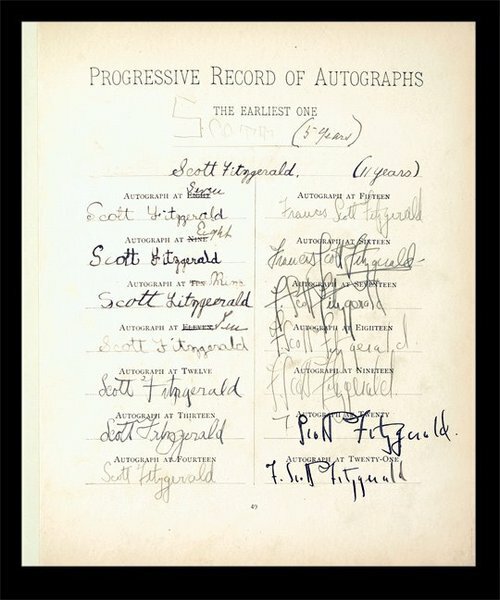 Helfand quotes a biography of Fitzgerald that references his mother, Mollie McQuillan Fitzgerald, and explains that Mollie kept extensive records of her son’s youth (first cry, cute sayings, dance cards, and so on).